Below is an article from a Movemeon member, Quentin, who moved from consulting to private equity through movemeon. A couple of years ago, MoveMeOn offered me my first experience in the private equity (‘PE’) world. I joined TowerBrook, a mid-cap private equity firm investing in SMEs in North America and Western Europe, as a Portfolio Group Associate. Having been catapulted as the first junior non-investment banker hire in the firm’s 15-year history has convinced me that the world of private equity governed solely by bankers is certainly over and that strategy consultants will play a greater role in the future. 1. Financial skills are now widespread in the industry and do not represent a competitive edge anymore. The days where only a handful of ‘geniuses’ mastered the intricacies of financial leverage are long gone. Every year, thousands of students across the globe graduate in a financial engineering-related subject. As a PE firm, shaping a team solely around those highly specific skills does not suffice any more to create a competitive edge. 2. Conversely, in a world where ‘too much money is chasing too few deals’, operational improvement stretches the field of possibilities. Private equity firms are now holding an all-time high of c. $1,300bn in ‘dry powder’, i.e. committed but non-invested capital – see chart below. As a consequence, the competition for assets is fiercer than ever and tight auction processes have become the rule. The tension between private equity investors’ two main objectives, namely meeting price expectations while delivering satisfactory returns to investors, has subsequently increased. Analysing the target not only from a financial but also from an operational angle is the only way to alleviate this tension. 3. Setting up a portfolio team is however far more easily said than done. There is no perfect model and each private equity firm will have to decide on the best structure and operating model given its overall strategy. Typical questions, to begin with, are: shall we go for a thin portfolio group supported by a network of experts or a fully-fledged team? Shall we only target experienced hires or shall we include more ‘hands-on’ junior profiles? Shall we favour generalist or specialist backgrounds? As returns from successful investments diminish, ‘stress-testing’ the investment thesis from multiple angles becomes increasingly important: The corollary of the previous point is that ‘bad’ investments are relatively more penalising than before. Nowadays, a thorough and multi-faceted due diligence is crucial to any investment. 4. Operational improvement strategies are becoming increasingly complex and now have to be handled by specialists. Private equity firms have been implementing basic cost-cutting and cash management techniques since the mid-1980s. However, the share of ‘secondary’ deals (i.e. a PE firm selling to another PE firm) has been steadily increasing and the room for obvious cost reduction measures has significantly shrunk as a result. This trend has led private equity owners to seek more holistic and acute transformation programmes whose implementation requirements often go beyond the traditional investment banker’s skillset. 5. Private equity firms are progressively acknowledging the importance of the ‘voice from the ground’, which consultants are trained to listen to. Private equity owners have realised that the success of an investment is highly correlated with the calibre of its executive team. A rising number of former headhunters and former HR directors have consequently joined PE firms in order to assess the quality of the management team during due diligence and develop the team throughout the investment lifecycle. A single ‘talent manager’, however, cannot cover an entire company portfolio. Strategy consultants can use their ability to develop two-way relationships with their ‘clients’ to act as day-to-day links. Indeed, in a private equity environment, not only can former consultants influence and steer the firm’s strategy but also they can actively listen to the concerns of the management team. 6. 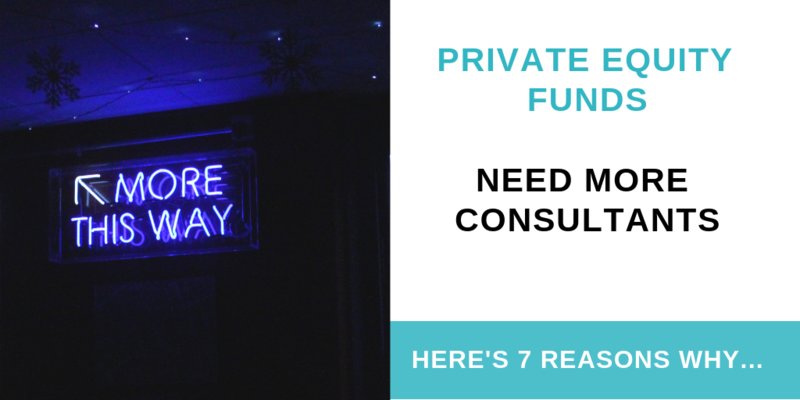 Former consultants are best placed to get the most of current consultants. When PE firms hire McKinsey, BCG or Bain, they do not care about slide formatting: they want to see analysis and recommendations. Having been on the other side of the table gives you a unique advantage to ‘skim the fat’ from due diligence reports and to enter more quickly into productive discussions. 7. Running an operating team will become a ‘must-have’ investment criteria for Limited Partners – and for the general public. Jack Welch, former Chairman and CEO of General Electric, was appointed Senior Advisor at PE firm Clayton, Dubilier & Rice (‘CD&R’) in 2001. I am sure that Mr Welch’s wisdom is valuable to CD&R’s management teams, but undoubtedly there is also an element of public relations at stake here. Furthermore, the excesses of private equity have left a bitter taste in the mouth of the general public – millions have read Barbarians at the Gate. Operating partners give a more human face to the private equity industry.